Surrounded by the elegant and majestic high rises of Brickell Ave, stands 1525 S. Miami Avenue, a luxury custom home we built in the heart of the Brickell Financial District. It was an exciting and challenging project for our custom homes division since it required not only the demolition of the previous residence but also building the exterior and interior of the new house. We never would’ve been able to build a modern home that’s warm and charming in the heart of the concrete jungle without the great creativity of our team and amazing relationship with our client. 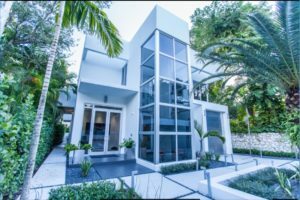 This job required a lot of coordinating and collaborating with the client, architect and sub-contractors from demolition of the old structure to the completion of the new 2-story home with a rooftop. The challenges we conquered included building a 6,000-square-foot home on a very narrow 7,500-square-foot lot. This called for the SPACiO team of experts to analyze the set backs required by the city to produce a luxury home of this size. Miami’s urban core is running out of land, which makes it increasingly difficult for general contractors to do more with little space. The planning was crucial in this project, which allowed the team to accomplish the project more efficiently. Another crucial component was being the liaison between the client, architect and sub-contractors to ensure that everyone was on the same page and ensure that SPACiO was turning everyone’s vision into reality. This involved holding weekly meetings from the pre-construction stage all the way through to post-construction stage. The next step in the project involved building out the interior. We used Porcelanosa products throughout the entire house, including the flooring, bathrooms, cabinetry, faucets, wall coverings and fixtures. We also built a stunning glass atrium in the entryway. Following the interior, we built the pool and pool deck as well as the rooftop that is surrounded by the Brickell skyline. It has an outdoor kitchen and a seven-person Jacuzzi. The team also installed an intricate AV system throughout the house and customized electronic gates on the outside of the house. It’s truly a gem among the skyscrapers and condo towers that line Brickell. Building custom homes often turn into nightmares for owners if they don’t hire the right general contractor. We take pride in producing high quality craftmanship and are committed to helping owners have a positive experience. Our entire team is there from the beginning to help the owner feel at ease to make decisions. We assign a team leader to communicate and coordinate with all the sub-contractors’ schedules so the owner always knows where we are in the process. We over communicate and report the project’s status and provide our clients with a detailed timeline and weekly update including photos or videos as needed. We are here to make the process as painless as possible. Give us a call to find out how we can help you build your dream home.